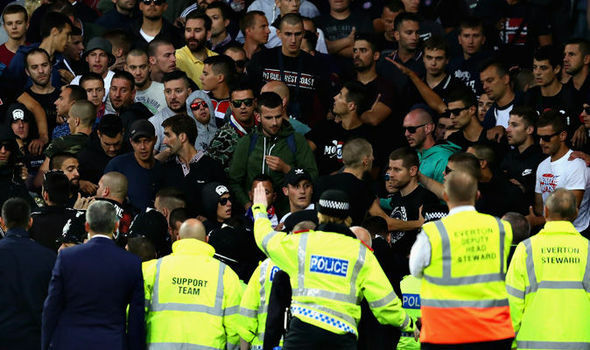 Everton and Hajduk Split have both been charged by UEFA following crowd trouble at Thursday’s Europa League match at Goodison Park. Visiting fans forced the game to be stopped for several minutes in the first half as they surged towards the pitch. But European football’s governing body has hit Everton with a disciplinary charge after accusing their fans of throwing objects during the incident. Hadjuk have been charged with four offences relating to the behaviour of their fans – throwing objects, crowd disturbance, invading the pitch and “acts of damages”. UEFA has yet to set a date for a hearing. Trouble broke out moments after Michael Keane had headed the opening goal in Everton’s 2-0 play-off first-leg victory. Slovakian referee Ivan Kruzliak halted play in the 33rd minute amid ugly scenes in the away section, with police and stewards forming a barrier in front of the Hajduk fans to help restore order.